The NYC real estate market is complex. There are condos, coops and even condops vs the single family homes you’ll find in suburbia. We’ll go over the most locally relevant questions to ask mortgage lender in the following article. How Much Business Do You Do in NYC? Is the Building I Want to Buy in Approved? How Do You Treat Self-Employment Income? How Do You Calculate the Debt-To-Income Ratio? How Long Are Your Rate Locks? What Is the Mortgage Underwriting Process Like? Are There Any Relationship Pricing Incentives? Do You Have Any Home Buyer Closing Incentives? What Are You Good At Financing? This is a critically important question to ask if you’re unfamiliar with buying and financing real estate in NYC. Many foreign buyers or even buyers from other states will pick small mortgage brokers or banks, or even online lenders because they saw an advertisement somewhere. However, this is a completely wrong approach as the NYC property market is substantially more complex and unique vs single family houses in the rest of the country. If the small bank or online lender you pick has no substantial experience lending against co ops or condos in NYC, then you’re very likely to experience delays in closing your deal, if it happens at all. As much as we hate to say it, the big banks based in New York City do generally offer better rates and smoother execution. That’s because they have the balance sheets to back up their mortgage loan officers and the deal experience to get your loan approved faster. When it comes to financing your purchase, less execution risk is always preferred! Pro Tip: A pre-approval letter from a reputable, well known lending institution will be so much more credible when it’s time to submit an offer in NYC. Listing agents will simply be more comfortable knowing that a major financial institutional has vetted you for a loan. If you’re ready to buy an apartment in NYC and know where you want to live, then it’s a superb idea to make sure your banking institution has already approved the condo or co op building you’re interested in. If not, the mortgage loan process will take longer as your bank will need to do due diligence on the building as well. This typically means having the building’s managing agent answer a condo or co-op building questionnaire. If it’s a reasonably sized building that isn’t completely new, then it’s likely that most major financial institutions have already loaned against purchases or refinancings in the building and as a result the building will already be approved. A smaller building with only a few units or a recently built new development may not have the same variety of lenders that are familiar with the building as an older and larger building. Pro Tip: When you’re buying a new construction home in NYC, you can expect the sponsor to have already lined up a few preferred mortgage lenders who have finished project review and approved the building already. This is one of the most important questions to ask your mortgage lender in NYC if you work for yourself. It’s a fact of life that banks prefer W-2 income over self-employment income because of the perceived stability of receiving wages as an employee. As a result, you need to confirm with your mortgage broker or bank how they treat and value self-employment income. For example, some banks will take an average of your last two year’s income per your two most recent filed tax returns. Some lenders may be more aggressive and let you use an average of your last year’s tax return and your current year profit and loss statement. This method is more aggressive as your profit and loss statement is self-generated and you won’t necessarily be held to it if you miss your targets. Some banks are more conservative and will only give you a partial credit for any increase in income from the first year’s tax return to the second year’s tax return. For example, if you made $200,000 of self-employment income on your tax return from two years ago, but made $300,000 on last year’s tax return, then a conservative bank may only give you a 50% credit for the increase. This means they would take the average of $200,000 and $250,000, and your income for debt-to-income ratio calculations would only be $225,000. What’s worse is we’ve seen some banks reduce your income by your SEP-IRA contribution even though it was a voluntary contribution! Pro Tip: If you’re an investor, an important question to ask your mortgage lender is how they treat depreciation which is a non-cash expense. Some lenders will agree to add depreciation back to your income for debt-to-income ratio calculations. Even though the debt-to-income ratio (DTI ratio) is a relatively standard metric, each bank will have their own nuances around how they calculate this super important ratio. For example, what exactly will your bank include for expenses in the DTI ratio? Will they only count housing expenses such as your mortgage payment, home insurance and common charges or maintenance? This is commonly known as a front end DTI ratio. Or will they use a back end DTI ratio and also include mandatory expenses such as student loan payments, credit card payments and car payments? How exactly will your bank account for these other expenses? For example, some banks will completely exclude your car payments from your back end DTI ratio if you have less than 10 payments left (i.e. you’re close to paying down your car loan). In order to qualify as a Quality Mortgage by Federal standards, a borrower’s back end DTI ratio should not exceed 43%. However, does your bank have any flexibility around the ratio? How high of a DTI ratio will they accept if they are holding the loan on their books vs selling it off to Fannie or Freddie? Pro Tip: Read our article on the NYC mortgage process to learn more about the debt-to-income ratio and what goes into both the numerator and the denominator. This is one of the most important questions to ask your mortgage lender in NYC due to the wide variety of answers. It’s common to see rate locks being offered for 30, 45, 60 or 90 days. However, we’ve also heard of major banks based in NYC offering rate locks up to 180 days. Obviously, the longer your rate lock the more flexibility you’ll have around your closing date. It’s also important to understand what if anything more you’ll have to give up in return for a longer rate lock period. Pro Tip: It can take up to 90 days on average to close a financed deal after a purchase contract has been fully executed in NYC. As a result, you don’t want to do a rate lock too soon as the penalties for extending a rate lock can be quite severe. The reason this is one of the questions to ask your mortgage lender in NYC is to get a sense of how much bureaucracy exists at the lending institution. Is the mortgage underwriter a person that is easily accessible by your mortgage loan officer? Or is it an offshore team that only is reachable by email with a one day time lag? You want to get a sense of how many hoops your mortgage banker will have to jump through if they need to approve you for an exception. Pro Tip: This question is also fantastic because it gives you an opportunity to hear how much your mortgage banker actually knows. You will very quickly be able to tell whether your mortgage loan officer is experienced or not, and whether he actually knows what happens during the mortgage underwriting process. Most major banks will have relationship pricing incentives for customers who have depository relationships with them. Banks realize that helping a person finance a home purchase is one of life’s key moments, so they want to do everything possible to be involved. As a result, banks will often have tiered incentive levels depending on the amount of cash the customer has deposited with the bank. For example, a major bank headquartered in NYC told us that they’ll reduce a borrower’s mortgage interest rate by 1/8% with a $50,000 deposit at close, and by 3/8% with a $200,000 deposit at close. They also mentioned that you could move the money from your checking account the day after closing without penalty! Does the bank offer any first time home buyer closing credits or other incentive programs? Often times banks will offer closing cost credits and incentives to first time home buyers or low income home buyers in conjunction with the government. These incentives can be something small, like $500 added to your checking account when you begin a depository relationship with a bank in conjunction with your home financing. They could also be much more substantial, like a $5,000 closing credit for first time home buyers. 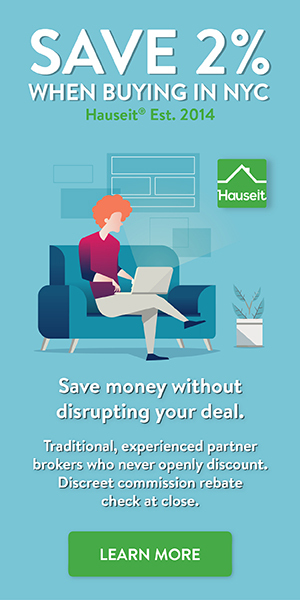 Pro Tip: Sign up for a Hauseit Buyer Rebate and save $20,000 or more on your closing costs! It’s free for you to work with a buyer’s agent, so not only will you receive free guidance throughout the home buying process, you’ll also receive some of the built in broker commission to help cover your closing costs! This is an important question to ask your mortgage lender because institutions will have different strengths and specialties in the complex NYC real estate market. For example, some banks may specialize in HDFC coop transactions. Other banks may specialize in financing for foreign buyers of NYC property. Other banks may admit that they’re competitive on rates but otherwise quite strict, and therefore only good for plain vanilla transactions. It’s important to have a heart to heart conversation with a mortgage banker before letting them pull your credit. You want to make sure their institution has a shot of approving your loan before you get too far with them!